Unravelling the mechanical properties of bone with micro-indentation testing has significance in both health and disease. At the University Medical Center Hamburg-Eppendorf, Dr Björn Busse and his research group have advanced their micro-indentation testing technique using an Olympus industrial inspection digital light microscope, as an alternative to electron microscopy. The cutting edge research is described in a new application note from Olympus, available online. Micro-indentation analysis is a popular tool for investigating the mechanical properties of a material. When investigating cross-sectioned bone samples embedded in polymer, the visual inspection of the indentation site is vital to verify the analysis of mineralised material rather than polymer matrix. In Dr Busse’s laboratory, scanning electron microscopy (SEM) was previously employed, but this was found to be both labour-intensive and time-consuming. 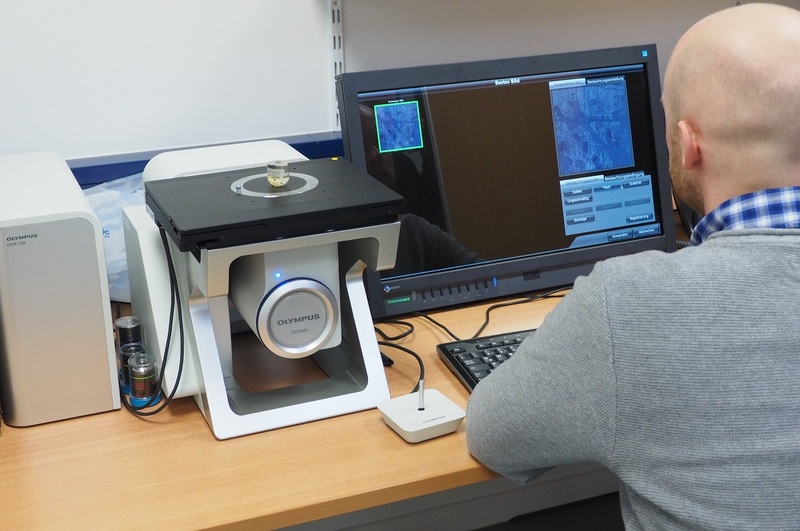 Indentation assessment has now been streamlined using the latest digital light microscopy technology of the Olympus DSX500i inverted microscope. Dr Busse comments: “In the past we used SEM, which is labour-intensive in terms of sample preparation, and the DSX500i now provides a faster and easier way of ensuring we have indented the correct region.” Merging high resolution and operating simplicity, the all-in-one, fully motorised system features 13x zoom optics and a host of digital capabilities to enhance a range of inspection tasks. The inverted platform also overcomes the restrictions of sample size, allowing the largest samples to be investigated. The system has since been updated with the Olympus DSX510i, which now features guaranteed repeatability of measurements along the XY axis and Z-plane, in addition to upgraded digital features. Combining Olympus’ digital light microscopy technology with micro-indentation testing offers possibilities throughout a vast field of applications across all sectors of material science. In fact, the DSX range was designed with industrial quality control in mind, and the innovative work of Dr. Busse’s laboratory reflects its inherent versatility. In the industrial setting, the ability to extract information from a diverse array of samples throughout a broad range of applications is highly beneficial. With its advanced capabilities and ease of use, the Olympus DSX510i digital light microscope presents many opportunities to accelerate research into the understanding the mechanical properties of bone – and other materials.